This is Lara Neel's most popular pattern on Ravelry and for good reason! The pattern is fairly easy and customizable. I followed dashful's pattern edits on Ravelry so that the slippers were larger with taller sides more appropriate for bigger feet. Thankfully, the yarn cooperated and felted to the right size (I should really get in the habit of swatching... *laze haze*). The only thing was that the toe areas got a little pinched where the seam was. I'm not sure what the problem and fix is to that? Google time. Like other reviews said, the bottom of the slippers are rather SLIPPERY. 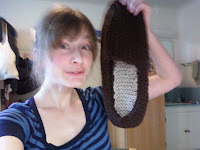 One knitter tried "smearing the soles with textile glue," and was satisfied with the rubbery (and grippy) residue. Another knitter suggests puffy paint. Dad didn't seem terribly concerned about his, but I might sneak in an "experiment" on the bottom of slippers anyway. I love to see how other knitter's patterns come out in comparison: how designs and textures look with different colors, what sizes were appealing, changes stylistically, and so on. My Ravelry favorite would have to be yarnbonny's colorfully creative slippers. Pretty stinkin' adorable!